John Franklin Carter, one of seven children of an Episcopalin minister, was born in Fall River, Massachusetts, on 27th April, 1897. An intelligent student he attended Yale University with Henry Luce, Archibald MacLeish, Stephen Vincent Benet and Thornton Wilder. After leaving university he attended the Williamstown Institute of Politics in Italy. Later he was the Rome correspondent for The Daily Chronicle. He was employed by Briton Hadden, the editor of Time Magazine, in March 1923. However, a month later he joined the New York Times. In 1928 Carter was employed by the State Department as an economic specialist. He then became a correspondent for the magazines Liberty and Vanity Fair. Carter first met Franklin D. Roosevelt in January 1932. The two men became close friends and Carter became an ardent supporter of the New Deal. He was also an advisor and speechwriter for Henry Wallace, the secretary of agriculture. He was described by a colleague as "brilliant, cynical, occasionally cockeyed and always exciting." He was also the author of the books, The New Dealers (1934) and American Messiahs (1935). In 1936 Carter adopted the pen name, Jay Franklin, and began a syndicated column, We, The People. His office in the National Press Building was close to the White House and usually reflected the views of Roosevelt. In January 1941, Carter told undersecretary of state Sumner Welles, that America's various intelligence services were "pretty well loused up and floundering around" and "there might be a use for a small and informal intelligence unit operating out of the White House without titles". On 13th February, 1941, the President approved the establishment of "a small special intelligence and fact finding unit" under Carter. Persico also claims that President Franklin D. Roosevelt arranged for plausible deniability. Carter later admitted: "The overall condition was attached to the operation by President Roosevelt that it should be entirely secret and would be promptly disavowed in the event of publicity... That year's military appropriations act included an Emergency Fund for the President, from which FDR transferred $10,000 to the State Department... to finance Carter, ostensibly by buying from him surveys on conditions in various countries, with Germany leading the list.... By the end of 1941 Carter... was operating with $54,000 from the President's emergency funds." Adolf Berle was placed in charge of distributing the funds. On 20th February, Berle recorded: "Jay Franklin (J.F. Carter) came in to see me today. He stated as a result of his conversation with the President and with you, and preparatory to the work he had been asked to do, he had spent some seven hundred dollars, and that he would be broke by the end of this week... He wanted an advance of some kind against the compensation which he would eventually receive for his work. Accordingly I lent him seven hundred dollars... I am not, of course, familiar with what the President has asked him to do, nor do I wish to be." One of Carter's first tasks was to deal with Charles Lindbergh, one of the leaders of the American First Committee. Roosevelt was furious with Lindbergh after a speech he made on 23rd April, which included the following: "It is not only our right but it is our obligation as American citizens to look at this war objectively and to weigh our chances for success if we should enter it. I have attempted to do this, especially from the standpoint of aviation; and I have been forced to the conclusion that we cannot win this war for England, regardless of how much assistance we extend. I ask you to look at the map of Europe today and see if you can suggest any way in which we could win this war if we entered it. Suppose we had a large army in America, trained and equipped. Where would we send it to fight? The campaigns of the war. show only too clearly how difficult it is to force a landing, or to maintain an army, on a hostile coast." President Roosevelt told Henry Morgenthau, "If I should die tomorrow, I want you to know this. I am absolutely convinced that Lindbergh is a Nazi." He wrote to Henry Stimson and claimed that: "When I read Lindbergh's speech, I felt that it could not have been better put if it had been written by Goebbels himself. What a pity that this youngster has completely abandoned his belief in our form of government and has accepted Nazi methods because apparently they are efficient." Roosevelt asked J. Edgar Hoover to keep a watch on him. He willingly did so for he had been upset by Lindbergh's critical comments about the failures of the FBI investigation into the kidnapping and murder of his infant son. Carter was also asked to carry out an investigation into Charles Lindbergh. According to the author of Roosevelt's Secret War (2001): "Within days, he delivered a fifty-page report for placement in the President's night time reading file. Thus armed, FDR was able to fire back when a reporter at a press conference asked him why Colonel Lindbergh had not been called to active duty. That was simple. Lindbergh, the President explained, was the equivalent of the arch-Civil War Copperhead Clement L. Vallandigham. The thrust drew blood. Lindbergh wrote FDR three days later resigning his commission as a colonel in the Army Air Corps Reserve. In Roosevelt's mind, his assignment to Carter had not been prompted by personal animus. Lindbergh, in FDR's eyes, was an enemy of his country, as dangerous as any fifth columnist, and had to be exposed." On 16th May 1941, Carter sent Roosevelt a report from a Swedish member of parliament "who has a record of being 60% right ... on all developments since Munich." The informant reported that millions of German troops were massing on the Soviet border, and "maps of Russia were being printed in huge quantities." Carter's source also predicted the invasion toward the end of June. "The Germans are reported confident that they can beat Russia in one or two months." British intelligence had also received similar information from other sources and Richard Stafford Cripps, Britain's ambassador to Moscow, had held a press conference and declared that Germany would attack Russia before the end of June. The Soviet spy, the German journalist Richard Sorge, cabled his Moscow controllers that the invasion would begin on 22nd June, 1941. Joseph E. Persico has argued: "The Soviet dictator was convinced that the capitalists would spread any canard to drive a wedge between him and his new ally, Germany. This partnership, he believed would keep his country safe from attack while Hitler went about swallowing up the rest of Europe.... On the night of June 21, a German soldier deserted to the Russian army and told his interrogators that an attack would take place at 3 a.m. the next morning. Within three hours Stalin had the report, but rejected it and supposedly ordered the bearer of the news shot. The invasion that FDR had known about for over five months began when the deserter said it would. Like the husband who is the last to know that his wife is faithless, Stalin was stunned by the invasion. As the depth of Hitler's deceit and his country's debacle sank in, Stalin went into a depression approaching a nervous breakdown." President Franklin D. Roosevelt became concerned about Japanese Americans living in California. In November, 1941, Roosevelt asked Carter to investigate fifth column infiltration, particularly by Japanese living on the West Coast, whether American citizens or aliens. Carter sent a Chicago businessman, Curtis B. Munson. He later reported: "There are still Japanese in the United States who will tie dynamite around their waist and make a human bomb of themselves... But American-born Japanese were... universally estimated from 90 to 98 per cent loyal to the United States... They are very American and are of a proud, self-respecting race suffering from a little inferiority complex and a lack of contact with the white boys they went to school with." After Pearl Harbor Roosevelt decided that he needed to take action against Japanese Americans. On 29th January 1942, the U.S. Attorney General, Francis Biddle, established a number of security areas on the West Coast in California. He also announced that all enemy aliens should be removed from these security areas. Three weeks later President Roosevelt authorized the construction of relocation camps for Japanese Americans being moved from their homes. Over the next few months ten permanent camps were constructed to house more than 110,000 Japanese Americans that had been removed from security areas. These people were deprived of their homes, their jobs and their constitutional and legal rights. In the summer of 1942, Carter had interviewed Ernst Hanfstaengl, who had been very close to Adolf Hitler, Hermann Goring, Heinrich Himmler and Joseph Goebbels in the 1930s, in an internment camp in Canada. He left the meeting convinced was eager to work for the Allies against the Nazis. President Franklin D. Roosevelt agreed that Hanfstaengl should be recruited but Winston Churchill disagreed because he feared that it would confuse people into believing "that there are good and bad ex-Nazis". Roosevelt eventually got his way and on 24th June, 1942, he was flown to Washington under the name of Ernst Sedgwick. In July 1942, he was established on a farm in Virginia under the control of Donald Chase Downes. 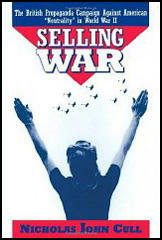 He later was used by Roosevelt as a "political and psychological warfare adviser in the war against Germany." Early in 1944, John Franklin Carter, who was in charge of an intelligence unit based in the White House, suggested to President Franklin D. Roosevelt a scheme developed by Ernst Hanfstaengl. He suggested that Hanfstaengl should be allowed to fly to England and meet with Hess. Roosevelt contacted Winston Churchill about this and then vetoed the scheme. According to Joseph E. Persico, the author of Roosevelt's Secret War (2001): "The British, he explained, were not going to let anyone question the possibly insane Nazi, who had recently hurled himself head-first down a flight of stairs." A few weeks after the death of Roosevelt, Carter sent a secret memo to President Harry S. Truman explaining how he was running a "small special intelligence and fact-finding unit" for the White House. "I simply wish at this occasion to spare you the possible embarrassment of being consulted on a matter concerning which only President Roosevelt and myself had full knowledge." Truman was unimpressed and closed the unit down. In an interview with Jerry N. Hess, Carter commented: "I became somewhat disillusioned with the Democratic Party and the administration. I was strongly attracted to Bob Taft and I decided to make the switch. But after I attended the Republican convention, as a newspaperman in 1948, I was so appalled by what I regarded as Dewey's arrogance, and what I also regarded as Taft's stupidity, that I saw nothing for it but to return to the fold." As a result, Carter became one of Truman's speechwriters in the campaign against Thomas Dewey. John Franklin Carter died on 28th November, 1967. FDR's least recognized agent, John Franklin Carter, who was now operating with $54,000 from the President's emergency funds, also continued to enjoy easy access to the Oval Office, thanks to his cover as a columnist friendly to the administration. Some assignments that FDR gave Carter were straightforward espionage, in one instance, having an agent investigate a Suspected fifth column operation on the French island of Martinique in the West Indies. Others skirted the defensible. Charles Lindbergh continued to infuriate FDR, especially after the aviator became the crown jewel in the isolationist America First movement. In late April 1941, days after Lindbergh gave his first speech as a member of the organization, the President called Carter into his office and began speaking in his elliptical fashion, leaving the journalist mystified as to where he was headed. FDR finally got around to the Civil War and the Copperheads, northerners who sympathized with the South. The President wanted Carter to look into present-day Copperheads. Carter now understood what was expected of him. Within days, he delivered a fifty-page report for placement in the President's nighttime reading file. Thus armed, FDR was able to fire back when a reporter at a press conference asked him why Colonel Lindbergh had not been called to active duty. That was simple. Lindbergh, the President explained, was the equivalent of the arch-Civil War Copperhead Clement L. Vallandigham. The thrust drew blood. Lindbergh wrote FDR three days later resigning his commission as a colonel in the Army Air Corps Reserve. In Roosevelt's mind, his assignment to Carter had not been prompted by personal animus. Lindbergh, in FDR's eyes, was an enemy of his country, as dangerous as any fifth columnist, and had to be exposed. On February 20, a week after FDR had approved Carter as his newest spy, Berle described to his superior, Sumner Welles, his less than impressive first encounter with the columnist. "Jay Franklin (J.F. Carter) came in to see me today. He stated as a result of his conversation with the President and with you, and preparatory to the work he had been asked to do, he had spent some seven hundred dollars, and that he would be broke by the end of this week.... He wanted an advance of some kind against the compensation which he would eventually receive for his work. Accordingly I lent him seven hundred dollars." Berle concluded, "I am not, of course, familiar with what the President has asked him to do, nor do I wish to be." Carter was cast in the Roosevelt mold - quick, bright, bold, passionate in his beliefs, with the passion leavened by practicality and a sense of humor. The new spy's assignments roved indiscriminately. Besides collecting intelligence, FDR wanted Carter to do political analysis, evaluate new weapons, troubleshoot military bottlenecks, and monitor other intelligence operations. It would no doubt have surprised and saddened Vincent Astor to learn that the President specifically asked Carter to keep an eye on his old friend's operation. After several months, Carter had only eleven full-time agents on the payroll in his determination to keep the operation compact. He managed a clever multiplier effect by obtaining from the U.S. Passport Division the names of persons given visas for travel to foreign countries and those of foreigners coming into the United States. 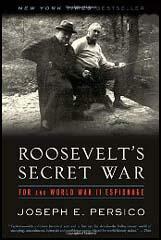 The world of secret agents, intelligence and espionage had long thrilled FDR. As Assistant Secretary of the Navy during the world war, he had dabbled in naval espionage, personally recommending and selecting his friends for duty as reserve intelligence officers in the Office of Naval Intelligence. As president, Roosevelt revived this interest in intelligence, believing that in the increasingly hostile environment of world economic depression and rising dictatorships he must have secret sources of information beyond that provided by official government agencies. Thus, he encouraged diplomats such as William Bullitt in Europe and Fred Morris Dearing in Latin America to bypass regular State Department channels and report confidential data directly to him, while urging Washington journalist John Franklin Carter to provide inside information about Roosevelt's own bureaucracy, a service which led to Carter's eventual employment as head of a secret White House intelligence unit. By now, FDR was using Carter to pry into everything from the loyalty of high-ranking federal officials to the feasibility of jet engines. But Carter's cover as a Washington columnist had created a dilemma for him. His desire for secrecy conflicted with his need to be recognized by government agencies with which he expected to deal. An encounter with Vannevar Bush, director of the Office of Scientific Research and Development and FDR's chief science advisor, illustrated Carter's quandary. In one of his casually tossed-off ideas, the President had asked Carter to evaluate a secret internal combustion engine being considered for the Navy. Carter had gone to Bush, whom he knew was heavily involved in the project. In¬stead of enlightening Carter, Bush had stiffed him. He told Carter, "I have no corresponding instruction from the President to enter into this matter now being considered by other organizations than my own. Will you kindly let me have a copy of your direction from the president?" Carter thereafter asked FDR to provide him with proof of his legitimacy. He drafted a "Dear Jack" letter to himself and asked Roosevelt to sign it. The letter read: "In order to facilitate the execution of your assigned duties and to assure you and your representatives the friendly cooperation of the other government services, you should establish contact with the heads of the Federal Bureaus, Departments and Agencies and with other intelligence services." Carter told FDR that he needed this proof of his bona fides to "avoid embarrassment" in carrying out his intelligence role. The President told Grace Tully to inform Carter that the answer was no. "I think it is better for him to give his men credentials," FDR advised. The rejection did not mean that Roosevelt was unhappy with the Carter operation, and the following January he agreed to raise Carter's secret budget. But the President's visceral resistance to committing anything to paper had again come into play. By refusing to sign the letter allowing Carter to snoop at will, FDR was merely saying, let someone else leave the fingerprints. Early in 1944, Carter brought to FDR another scheme concocted by Hanfstaengl. Rudolf Hess, once number three in the Nazi Party hierarchy, had, in 1941, made his quixotic solo flight to Britain to try to persuade Churchill to make a separate peace with Germany. Hess had never gotten near the Prime Minister, and for his pains had been locked up as a war prisoner. Carter urged the President to ask the British to allow Hanfstaengl to fly to England and meet with Hess, whom Putzi knew from the old days, in order to extract more recent intelligence from inside Hitler's realm. FDR vetoed the scheme. The British, he explained, were not going to let anyone question the possibly insane Nazi, who had recently hurled himself head-first down a flight of stairs. So I was put on the White House payroll by Donald Dawson. And in that way I found myself in the group. The working group consisted, as far as I could make out, of Philleo Nash, whom I didn't see too much, but saw quite a bit; Charlie Murphy, with whom I worked almost continuously; and I think Charlie and I carried the main load of the big speechwriting operation. Then, of course, during the actual whistlestop campaign, George Elsey. George and I shared a compartment on the Pullman, and I used to get up about 6 in the morning and work with George on some of these whistlestop speeches. Later in the day, Charlie and I would work on drafts for this, that, and the other major speech, but most of the speeches were written, except the whistlestops, by Charlie and myself, the major speeches, that is; with the exception, of course, of that Chicago speech, which represented some kind of a campaign commitment; a commitment that Truman had made. That's the only sense anyone could make out of it.